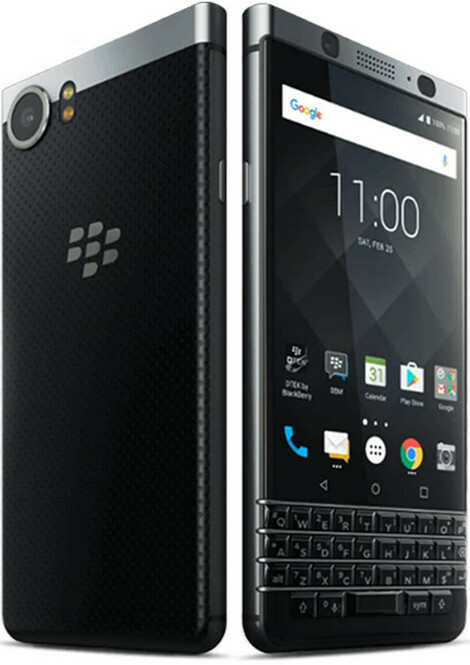 Here is something you need to remember; just because the AT&T version of the BlackBerry KEYone is black, it is not the Black Edition of the KEYone. The version of the phone available from AT&T sports the same specs as the original KEYone model that features 3GB of RAM and 32GB of native storage. On the other hand, the Black Edition of the BlackBerry KEYone offers 4GB of RAM and 64GB of native storage. For some reason, that model, and the similarly spec'd Bronze Edition, are not available in the states. What is available is an update for owners of the AT&T BlackBerry KEYone. According to the AT&T support page, the 42MB OTA update brings the January security patch to the handset. This includes protection from the Meltdown and Spectre flaws that have been heavily publicized over the last few weeks. When you receive notification that the update has arrived on your AT&T branded KEYone, you must connect to a Wi-Fi network in order to install it. While AT&T sees no impact to settings or data, the carrier suggests that you back up your media files before starting the installation process. While it could take a few days until the update appears on your KEYone, you can try to receive it manually by going to Settings > AT&T Software updates > Check for updates. Follow the directions on the screen. BlackBerry Mobile recently said that it will release two more models this year. This comes after the success of the KEYone, and the BlackBerry Motion. The latter, recently released, is the first 'Berry with an IP certification rating (IP67) and a 4000mAh battery. Awesome Smartphone. The KEYᵒⁿᵉ is one of the best handsets out today, no question. I just wish the carriers pushed out the updates in a more timely fashion. Glad I have a factory unlocked BlackBerry KEYᵒⁿᵉ, as the updates get pushed straight from BlackBerry themselves, bypassing the carriers. Haven't had a carrier locked Smartphone in a while. One thing that Apple has certainly gotten right is having the ability to bypass all of the carriers and push the updates straight to the handsets themselves. Wish all OEM's were able to do this. Agree with you, Meanestgenius. KEYone is good phone. Also agree about update. To buy unlock GSM phone is best way to go to get timely update. To use GSM phone also mean you have future proof phone because CDMA network will soon be gone in a year or two. There's isn't an inherent difference between GSM unlocked and CDMA-GSM unlocked and it's a win for the consumer with the latter. Is there any reason why either is so important all of a sudden to bring it up out of the blue? Is there reason why you so offended that I say CDMA will be gone in year or two? What it matter to you if I say this truth? GSM unlock is future proof, as it will be here for many years forward. CDMA will not. You are just trying to start fight now. I read an article that stated that the 600 series of the SnapDragon wasn't susceptible or at risk based on its memory management being streamlined. Anyway, who knows? Got a question for anyone using Blackberry. I am thinking about buying a Key1, but the Passport is about $300 cheaper and will still be supported for 2 years. Will the Passport have a longer support line than the Keyone based on how the Priv was treated? I want to get my hands on that old school PKB on the Passport and people say it is better than the one on the Keyone. Don't know but might buy one to find out since I only would use the device for a year or two anyway. Little late than never, but good to hear that it's been released for the AT&T version. Unfortunately it seems that the weird update distribution still exists for the different KeyONE out there. I think the update process would be a little streamlined if blackberry had just one version available. Now the only question that remains is when will Oreo be available? You are correct about AT&T procrastinatination. All carrier always drag their feet with update for phones. Carrier testing, carrier add bloat to phone, etc. This happen for ALL carrier branded locked phone, not just KEYone. Same delay for Samsung, LG, ZTE, and almost all other OEM Phone. You know this, I know this. Anyone that really know anything about carrier and carrier locked branded phone know this. I agree Subie. This is why I wonder why blackberry doesn't just sell unlocked devices for everyone entirely like some other OEMs do. Then the problem would lie on the OEM and not just be carrier dependent. Some OEM like Samsung, LG and Motorola make unlock device for carrier, but not all get update at the same time, so that is not the answer. The answer is all OEM need to bypass carrier when it comes to update. But not all OEM can do this. Carrier does not allow it for all OEM. Excellent point, MDCO. Totally agree with you. Er that's kind of what I just said with slightly different wording. Only thing is that OEMs can push the update out and you can get it by popping the sim card out. That is not the same thing I said. And why you change your comment? Originally, you mention Moto X Pure and popping out the SIM card. I should have taken screenshot. LG G6, Samsung Galaxy S8 and Motorola G Line all have all carrier radio, and still they are not updated at the same time for phone that have carrier brand. And to say all you have to do is pop out SIM card is to prove my point. Carrier control the update for carrier frequency locked phone with carrier brand. What are you talking about? I didn't change anything nor did I say or infer anything about the Moto X Pure. There's a difference between carrier versions that have all bands and unlocked versions that supports all carriers. Perhaps that is what you were trying to get at. Lol Lol Lol you did edit post to say something different. I know why you did so. I should have taken screenshot. How is there difference if both version support all carrier frequency? Because one has carrier brand on it and other does not? Both still support all frequencies. OEM has to be able to bypass carrier, and that is not case for most OEM.